All slots on Feral can function as a VPN if you need one. This article will take you through the installation and usage of OpenVPN. You do not need any pre-assumed knowledge or experience to use this guide. It is very simple to install the server-side part of OpenVPN as the Feral web manager supports its installation. Please follow the separate guide to installing software from the web manager, selecting OpenVPN from the list. All the installation does is put a copy of the configuration, keys and certificates files onto your slot. You can download them from the directory ~/private/vpn/ to your computer using an SFTP program. You'll need to download the OpenVPN client for windows. You'll need to download the config and the keys folder as above and place them in the OpenVPN config folder on your computer. They keys and certificates should remain in the keys folder. You may first need to download to somewhere like My Documents and then manually copy them into the config folder. This is what you should see in the folder window. 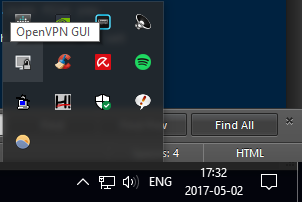 Open the OpenVPN client (you may need to do this as an administrator), right click its icon from the taskbar and select Connect. Here is the icon you need to right click. The networking stack of macOS has VPN support built-in, but you may find a dedicated client offers better configuration and is easier. Tunnelblick is a free option you can try; another (paid) option is Viscosity. To import into Tunnelblick, create a folder on your computer named feral. Copy all the config, key and cert files into this folder from your slot (location ~/private/vpn/) and add the extension .tblk. You should then be able to double click the icon to install the configuration. In Viscosity's Preferences, click the + and select Import Connection. Navigate to and select the client.ovpn file you previously downloaded. Viscosity will then import all the necessary keys and certificates. You may need to adjust some authentication settings. In Preferences, select Authentication and make sure the Tls-Auth direction is set to 1. You should of course first download the app from the Play Store. Transfer the contents of ~/private/vpn/ and make sure that the client.ovpn and keys files are in the same directory on your device. Open the app on your device and select, Menu, Import then Import Profile from SD card. Navigate to the client.ovpn file and select it. When you first go to connect you'll be prompted to confirm that you trust the application. You should allow this if you wish to connect. Download OpenVPN Connect from the app store and open up iTunes on your computer. On your devices file sharing tab, navigate to and select OpenVPN Connect from the list of apps. Add the client.ovpn file and the contents of the keys folder (rather than the folder itself) to OpenVPN Connect's folder. After starting the app on your iOS device you'll be prompted to add a new connection. Do so by pressing the + sign. It should then import the necessary details.